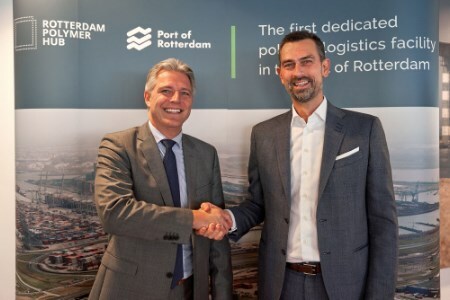 The Port of Rotterdam Authority and Rotterdam Polymer Hub (RPH) signed an allocation agreement regarding a site for two halls for the storage and distribution of polymers. RPH will be the first logistics node in the Rotterdam port area to focus exclusively on the storage of polymers. The project is a joint initiative of the Port of Rotterdam Authority, Euro-Rhine Group and entrepreneur Geert Van De Ven. The two halls, with a combined floor area of 35 000 m² (storage capacity 550 000 t) will be erected at Maasvlakte. The selected sites are eminently suited to polymer storage thanks to the close proximity of various deep sea container terminals, ultra-modern infrastructure and good connections with the European hinterland. RPH will consist of a hall for the storage of packaged products, an outdoor area where cargo can be kept in 30 ft containers and, in the longer term, vertical silos for bulk storage. The operator expects to take the halls into use in the third quarter of 2019. Over the next few months, the partners will be introducing RPH at the EPCA in Vienna, the GPCA annual meeting in Dubai and the Petrochemical Supply Chain & Logistics Conference in Houston.